Tuesday September 5th 1899 An intensely hot day. Will sold three steers for $50.00 each and took them two miles after dinner I canned tomatoes in the forenoon and tried to sew some in the afternoon. Wednesday September 6th 1899 Will and Luther both went to town this morning Will came home by noon. I dried more corn today I sewed some in the afternoon Weather very warm. 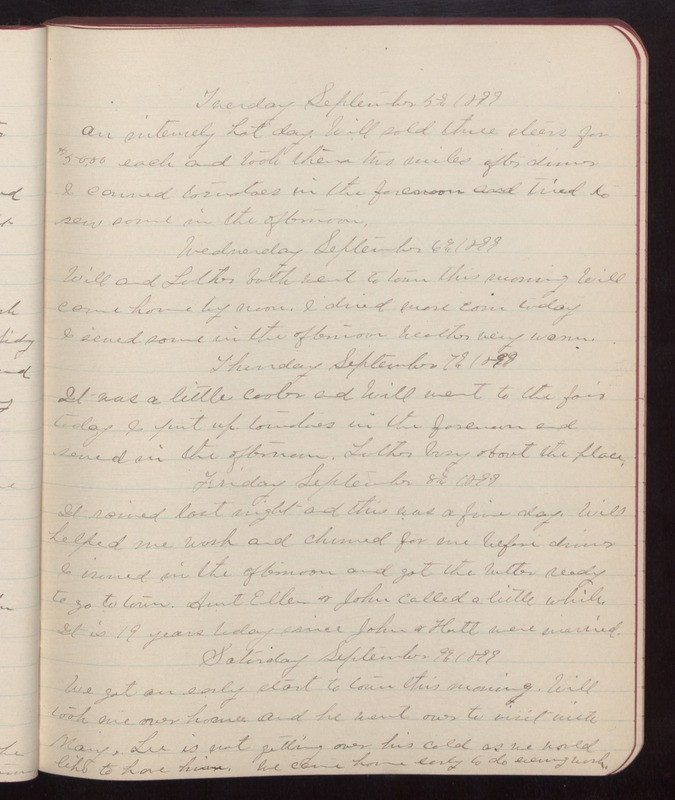 Thursday September 7th 1899 It was a little cooler and Will went to the fair today I put up tomatoes in the forenoon and sewed in the afternoon. Luther busy about the place. Friday September 8th 1899 It rained last night and this was a fine day. Will helped me wash and churned for me before dinner I ironed in the afternoon and got the butter ready to go to town. Aunt Ellen & John called a little while. It is 19 years today since John & Hatt were married. Saturday September 9th 1899 We got an early start to town this morning. Will took me over home and he went over to visit with Mary, Lee is not getting over his cold as we would like to have him. We came home early to do evening work.